These days there are several Israeli Martial Arts floating around and people find it a bit confusing to figure out the differences. Many of the differences are organizational, i.e. very similar styles but different organizations. Other differences are historical. Israeli martial arts have been growing in popularity. Recently both the history channel and the Discovery channel did shows about Krav Maga. Most importantly are the differences based on what the style includes and focuses on; that is what I will address here. Israeli Martial Arts in the 1930's was known as Kapap which is the Hebrew abbreviation of Krav Panim el Panim, face to face combat or, battle. This apparently included the earliest form of Krav Maga. It was taught to members of the Palmach; the early commandos of the pre-state of Israel fighting force known as Hagana. This was not specifically a martial art but an overall training program that included everything a commando needed; hand to hand combat, rigorous physical conditioning, firearms, explosives training, radio communications, navigation, wilderness survival training, combat first aid and foreign languages such as German and Arabic. From the photos it is clear the physical conditioning was taken very seriously. We see hikes, mountain climbing, swimming, obstacle courses and a great deal of rope climbing. The hand to hand combat had yet to be called Krav Maga; it was simply the unarmed portion of the training. This included boxing, judo, wrestling, knife fighting, stick fighting and gun disarm. Some veterans whom I have spoken with told of training with jackets; pulling it off rapidly and covering the enemy's face and then taking him down. Some excellent photos can be found on the official Palmach website although you will need some Hebrew to navigate through the many photo albums. The style was known for its use of sticks, the short staff in particular. Most speak of a stick that was about a meter long. Countless youth of the time became experts in its use. Old timers I have met still talk of using their stick to fight off Arabs with knives. Palmach members training in Kapap stick fighting. 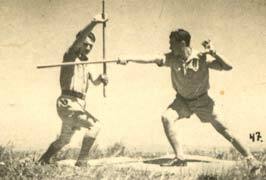 One of the uniquely Israel applications of this stick fighting was the aggressive, offensive nature of the training and of its use. Practitioners describe that when an attacker appeared someone would shout "The enemy is here!" and the practitioners would raise up their sticks in one hand while the other hand was ready for action as well. You do not run away. You face him straight on and make it clear you are not afraid. You wave your stick at him. You are taught not to fear any situation. A weapon may be dangerous but when you are well trained in it you no longer think of it as dangerous. You are trained how to use it against your enemy. Soon enough, he will back off. The early Krav Maga training was a part of Kapap. According to Itay Gil, the term Kapap was still used somewhat in the early 1960's but then fell into disuse. The term Krav Maga replaced the term Kapap. (for a while both were used interchangeably) By the early 1960s Kapap ceased to exist. This same information can be studied in the excellent book by Noah Gross. The unique aspect of Kapap was the use of the stick, Noah Gross writes, "the 1960s saw the end of this era". Today Krav Maga is an efficient close quarter combat system but does not include such things as explosives training or learning foreign languages. None the less, the same early philosophy still applies; neutralize the enemy as quickly as possible using aggressive forceful, simple, techniques. To remain cutting edge and effective, Krav Maga is still evolving . This is reality. Lotar is a Hebrew abbreviation for Lochama be terror - Combating Terrorism. Lotar is a general term used to describe the means, tactics and strategies that the Israeli government uses to combat terrorism. Lotar is an inclusive concept meaning anything the government, police, and military use to thwart the efforts of terrorism. It is not a specific martial arts although it does include the hand to hand art of krav maga. Today this system is being marketed commercially outside of Israel as a martial arts style. The war against terror includes not only military or political aspects but financial, commercial and legal aspects as well. The special police unit known as Yamam, which my instructor Itay Gil trained, is often referred to as the "Unit that fights terror" (Lotar) although its official purpose is defined as dealing with hostage situations as well as various encounters based both on terrorism or criminal violence. In terms of the martial arts aspect, historically Lotar replaced Kapap. For decades the term Kapap was not really used until recently when it was revived as a commercial martial art. Part of the Lotar program is stress training; preparing the special police officer to be able to operate and function under the ever changing, worst case scenario combat environment. Of course the police aspects of Lotar include weapons training and combat conditioning. The YAMAM, the elite of the elite within the Israeli Special Forces are considered the best in the world when it comes to Counter Terrorist Tactics and Execution. The Yamam is a police unit and part of the Israel Border police. Much of their activities are kept out of public view. Enough said on that topic. The Yamam was established in 1974 after the terrible massacre in the Israeli town of Ma'alot . It was determined that a special unit was needed to handle hostage situations within urban areas.